MCLEAN, Va., Nov. 20, 2018 /PRNewswire/ -- According to the 2018 CreditWise® from Capital One® Holiday Shopping Survey, 85 percent of those U.S. consumers surveyed believe the holidays are a riskier time to shop. More than a third of survey respondents (37 percent) also said identity theft and financial fraud is their No. 1 concern about shopping during the holiday season, ahead of their fear of spending too much. The survey also found that 1 in 4 (26 percent) believe Cyber Monday is a riskier day to shop online than any other day of the year. Despite those fears, only 17 percent took more action during the holidays in 2017 to protect their credit or prevent fraud, with millennials being twice as likely to act than other age groups during the holidays. 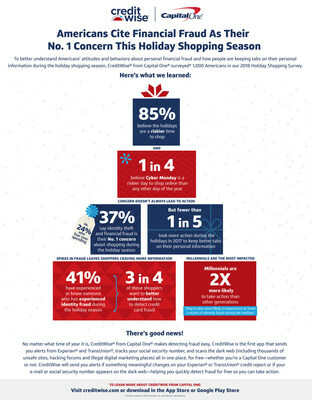 "Ahead of this holiday season, Capital One wanted to understand what really keeps consumers up at night when it comes to holiday spending," said Joe Whitchurch, Head of CreditWise at Capital One. "We found that identity theft and fraud is a top concern for consumers as they prepare for both Black Friday and Cyber Monday. In fact, according to our survey, more than half of the respondents (62 percent) who know a victim or were themselves a victim of fraud said they could use more help in keeping tabs on their personal information. The good news is they can start simply by downloading the CreditWise app to take control of their personal information and quickly detect fraud for free." 41 percent of U.S. consumers surveyed have experienced or know someone who has experienced fraud during the holiday season, primarily as a result of credit card fraud (48 percent) and identity theft (33 percent). 16 percent of survey respondents say they are more worried than they were last year about identity theft and financial fraud. Millennials are twice as likely than other age groups to take action to protect their credit scores or prevent fraud during the holidays. Millennials are also more likely to know someone or have themselves been a victim of identity fraud than the older age groups during the holidays. 75 percent of respondents who know a victim or were themselves a victim of fraud want to understand how to detect credit fraud. In 2018, CreditWise from Capital One launched three new tools to help users quickly detect fraud for free. The tools feature a Social Security Number (SSN) Tracker, Dual Bureau Credit Alerts from Experian® and TransUnion® and Dark Web Surveillance. The surveillance tool scans the dark web, including thousands of unsafe sites, hacking forums and illegal digital marketplaces, and alerts users if it finds users' social security number or email address so they can take action. Since launching these new features, CreditWise has uncovered 1.5 million email addresses on the dark web, and the surveillance alerts have maintained over a 90 percent helpfulness rating from users. With tools like CreditWise, Capital One is committed to building simple, human-centered, data-driven tools to help people easily detect fraud for free so that they can live their best financial lives. To learn more about CreditWise from Capital One, visit creditwise.com or download in the App Store or Google Play Store. The study by Capital One was conducted in October 2018 and fielded a nationally representative online survey of 1,000 U.S. respondents age 18 and older. The survey was designed to uncover U.S. consumers attitudes and behaviors regarding their credit score, fraud, and if and how they are keeping tabs on their personal information—especially during the holiday shopping season.